When it goes public, Facebook looks to be the largest tech or Internet IPO ever. A lot has been made about its $1 billion in profit and massive revenue numbers. But can Facebook continue to grow its revenue at an intense pace, or is it beginning to slow? Facebook's revenue continues to grow, but it grows at a slower pace every quarter. 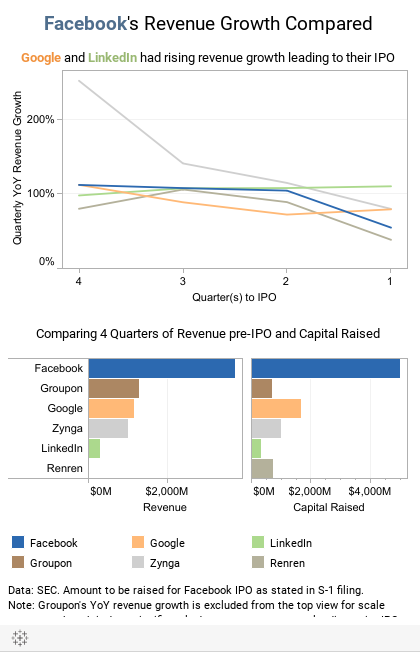 Compare this to Google or more recently, LinkedIn, whose revenue growth rate actually rose prior to going public. Investors pour their money into businesses they believe will continue to grow, so it will be interesting to see how Facebook shapes up with its IPO just on the horizon.